I showed the fabric, that I love so, to my hubby, he said it was nice but he likes what I have hanging on the line a lot better. This is a piece of pink cotton that was originally dyed with cochineal On cotton to get the best colors you really need to alum tannin alum your fabrics, and this gives dull dusty flesh toned pinks, if your cochineal vat isn't concentrated enough. 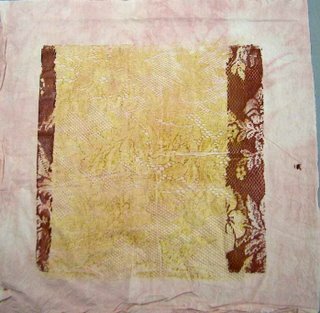 I then screen printed over it using natural dyes. This cotton is really soft and has a loser weave making it ideal for hand stitching.